One of the best bits of Visio is the connections between shapes, but it has always been difficult to understand these connections in code. There are connections to and from shapes, which require you to understand where you are and which way to look … at the begining or the end of a 1D connector. 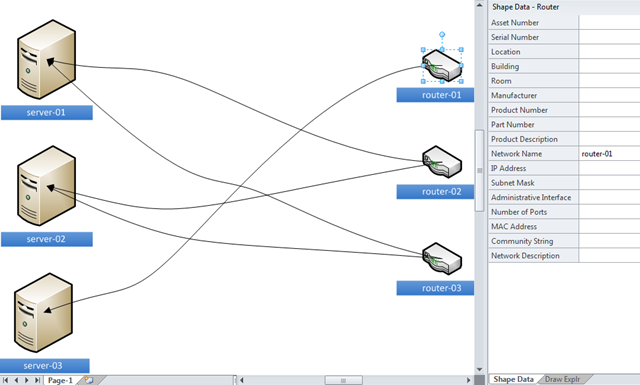 Visio 2010 has added some useful extra methods to the shape object which makes understanding connections much easier. This post will show you how you can use the new GluedShapes() and ConnectedShapes() methods. I think this makes interrogation of connected diagrams, of all flavours, much simpler, though I would love to have similar ShapeSheet functions too! sorry but I cannot understand why the following code give us the SOURCE IDs and not the TARGET IDs? I think, you asking the VISIO API for all the shapes, that are connected via outgoingnodes with shp. When I say shp.ConnectedShapes(visConnectedShapesOutgoingNodes, “”), then the method returns the shp2.ID thought? And shp2 is target and not source? Well, it’s been a while since I wrote this, but looking back at the code now, I think that you are correct – my Outgoing and Incoming could be the wrong way round. Thank you for the answer, as a newsbie I wasn’t sure, whether I understand the Connectivity API methods. – For each Shape –> Read Visio Shape Data Information from “Shape Data” Section. There are many additional informations like Prop.BpmnTaskType etc. What do you think about my considerations, are they correct, or am I wrong? I think that you could do as you intend …. provided all of the information that you need is stored in the Shape Data. In fact, I was a little surprised that an export wasn’t included for BPMN. Maybe export will be included as soon as the BPMN xml format is stable/final and there are process engines processing the BPMN files. Maybe I could get the index from Prop.BpmnLoopType Cell, but why Shape2 property is not changed to Standard Loop Task?